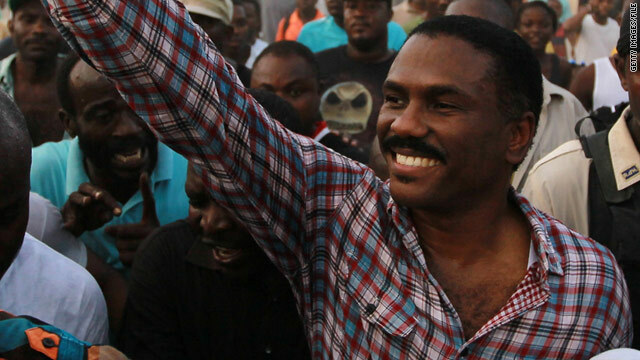 Candidate Jude Celestin's disputed second-place finish led to post-election violence in the streets of Haiti. (CNN) -- Haiti's ruling party is no longer supporting its presidential candidate, whose disputed second-place finish led to violent post-election demonstrations on the streets. A statement signed by leaders of the Inite (Unity) party Wednesday noted that the decision was made to help foster stability. But it was not clear whether the candidate, Jude Celestin, was dropping out of the race. Preliminary results of the November 28 election put Celestin in second place behind former first lady Mirlande Manigat. Neither won a majority and were to face each other in a January 16 run-off that has been postponed. The third-place candidate, popular musician Michel Martelly, claimed he had won more votes than Celestin and an review of results by an Organization of American States team supported that contention. That review suggested that Martelly earned a spot in the run-off. Celestin's withdrawal would clear the way for Manigat and Martelly to compete in a second round of voting. No date has been set for the election. The Inite party announcement, made to Haiti's Radio Metropole, comes after weeks of political chaos and international pressure to resolve the crisis. Celestin did not sign the statement. Several Haitian politicians expressed skepticism Thursday that Celestin was finished, the newspaper Le Nouveliste reported. Celestin was the hand-picked successor to President Rene Preval, blamed by the Haitian people for a perceived lack of progress after the devastating earthquake a year ago. After the announcement of preliminary results in early December, thousands of Haitians, many carrying Martelly signs, took to the streets to protest. During the unrest, several Celestin billboards were defaced or torn down and his campaign headquarters was set ablaze.